As many have noted, one of the biggest changes to the Twin Cities and national housing markets was the sudden influx and subsequent absorption of distressed properties. “Distressed” simply refers to any new listing, active listing or closed sale where the lender either owns the property (foreclosure) or the property was sold for less than the outstanding amount owed on the mortgage (short sale). As both the public and private sectors began laying off workers in conjunction with other cost-cutting efforts around 2008 and 2009, many households begrudgingly became single-wage households or worse. That generated a notable increase in mortgage delinquencies, which led to banks repossessing homes and selling them short. As financial institutions began listing these distressed homes for sale, buyers began taking advantage of the great deals. Many of those buyers were—and, to a lesser extent, are—investors, though some were ordinary families and individuals taking advantage of a historic opportunity. Due to a variety of factors ranging from rising home prices to the longest stretch of private job growth in decades, the share of market activity that can be categorized as either foreclosure or short sale is easing. In 2011, foreclosures and short sales together made up exactly 50.0% of all closed sales in the 13-county metropolitan area even though they comprised less than 42.0% of all new listings. This means they made up a larger share of the sales pie than the listing pie, signaling robust demand for these bargain properties. Fast forward to 2014. 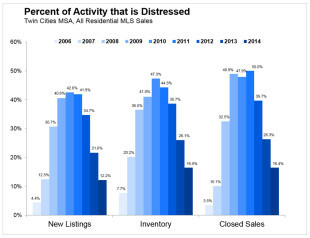 Last year, only 12.2% of all new listings were in distress while the figure was 16.4% for closed sales. Those numbers mark a dramatic decrease in the prevalence of distressed listing and sales activity in the Twin Cities region. Most of the active listings (inventory) in this segment has been absorbed off the market and institutions are listing fewer and fewer of them. So why should you care about any of this? Fair question. After all, foreclosure market share doesn’t exactly make for exciting backyard barbeque conversations, unless you’re a housing researcher (I swear I have friends that aren’t computers). But who doesn’t love talking about home prices? There never seems to be a shortage of speculation regarding where home prices might be heading next. Some think we’re in another bubble, others think we’re returning to historically typical levels of stable price appreciation. Since prices seem to be the preferred market barometer of choice for most consumers (anyone heard of an absorption rate or even price per square foot? ), it stands to reason that many consumers and real estate professionals alike would have a vested interest in better understanding what’s affecting home prices. By far the biggest factor affecting home prices is the percentage of all sales that are distressed—i.e. 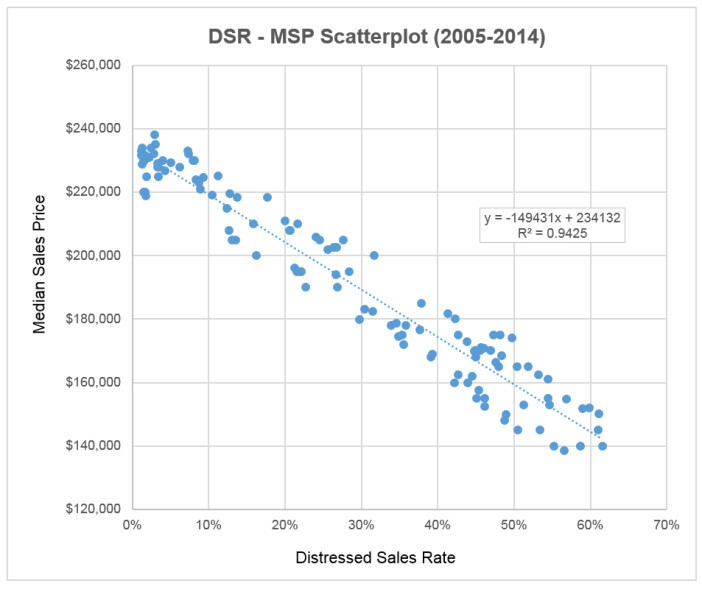 the distressed sales rate. Coincidentally, that is exactly what’s shown in the blue trendline to the left. Also plotted here is the median sales price for the metro. 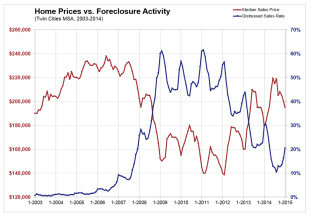 This chart shows the nature and strength of the relationship between the distressed market share and home prices. The nature of the relationship is an inverse one and the magnitude is quite strong. In other words, when distressed market share increases, home prices tend to fall and vice versa. And you can just about bet the farm on that one. For those who are wondering, the R-square between these two variables is 0.9425 and the relationship is statistically significant. This means that about 94.25% of the variation in home prices can be attributed to variability in distressed market share. If you had a 94.25% chance of success in betting big on a single stock or a poker hand or your favorite Canterbury horse, wouldn’t you? Gazing into the proverbial crystal ball, expect distressed market activity to fall below 10.0% for closed sales and likely below 8.0% for new listings. But those are just prognostications. Ultimately, if you’re wondering where home prices are heading next, simply follow the percentage of all closed sales that are either foreclosures or short sales. Wasn’t that fun? Until next time!